As noted poet Tony Batista once said, "Traveling first leaves you speechless, then turns you into a storyteller." Oh wait, that quote actually belongs to medieval Moroccan explorer Ibn Battuta. But Battuta was still correct: Cool things happen when you hit the road, and you should always tell your friends about it. Starting Thursday, we will embark on a month-long roadtrip across America. The destination? The Futures Game in San Diego. The goal? To see as many of baseball's top prospects as possible. The reason? We don't have any other marketable skills. We're Jake Mintz and Jordan Shusterman, two rising college seniors from the Washington D.C., area. During our senior year of high school, we started a blog called the Cespedes Family Barbecue because our other friends were sick of hearing us talk nonstop about baseball. Inspired by our namesake's epic introductory video in which 20 minutes of workout highlights are followed by a light-hearted family pig roast, we tweeted a few tweets, recorded some podcasts, flipped a bat or two and ended up on MLB.com for the summer. If you're just getting acquainted, we're into stuff like Backyard Baseball, baseball's greatest names and bat flipping around the world. Last summer, we saw 18 baseball games in 18 days and wrote about it here. We've taken a few road trips before, but this one is going to be bigger, better, and sweatier (we'll be in Albuquerque in July). Over the next 25 or so days, we'll travel through over 30 states and bat flip in each one. We'll spend roughly 125 hours in the car together, testing the boundaries of our friendship and our sanity. We'll drive more than 8,000 miles, which is eight times more than anything Vanessa Carlton promised. The Cespedes Family Barbecue, eight times better than Vanessa Carlton. (If you're reading this, Vanessa, we're completely kidding -- you're a legend and we love your work). Mostly driving and savaging our bodies with the finest roadside cuisine of America's heartland. Oh, besides that? 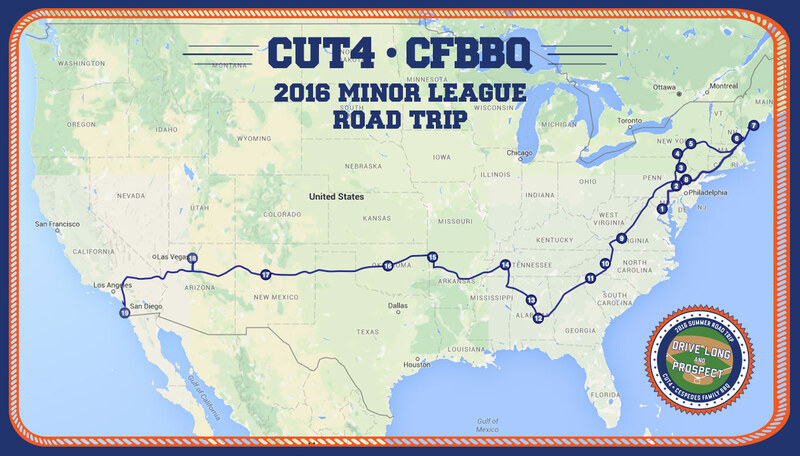 We'll take in at least 15 Minor League games and document all of our travels with stories and videos here on Cut4. The plan is to see more than 30 of MLB Pipeline's Top 100 prospects, and to help you learn at least a little bit about each of the game's future stars. But we won't limit the fun to only baseball's young phenoms -- the veteran warriors of the Minors deserve our love and attention, too. This will be a month of adventure and intrigue and baseball and driving and sleeping in random cities like Springdale, Ark., and Gallup, N.M. Jealous you aren't coming along? That's the correct reaction because it's gonna be dope. But we promise to do our best to make you feel like you're along for the ride. So buckle up, snag that AUX cord, and get ready for the trek of a lifetime. It's time to Drive Long and Prospect. What, exactly, does the full schedule look like? Prove your baseball mettle: Do you remember if this pitcher actually started on Opening Day?